The Aquadome is a 501(c)(3) non-profit, volunteer-operated venue dedicated to music, art, and community in Kirksville, Missouri. We primarily host concerts but are by no means limited solely to music. We also host potlucks, craft nights, workshops, art exhibits, poetry slams & readings, and plenty other events! In addition to this, we also rent out our space for privately organized events and as a practice space for bands. We’re open from mid August to early December and mid January to early May. All events are all ages! Interested in volunteering? That’s awesome! Go to this form. We have an Executive Board that is elected each Fall and Spring. They get to handle all the administrative work like paying bills, filing out business forms, and organizing the calendar. But they also get to do rad things like book bands and decorate and meet a lot of interesting people. But by no means do they run The Aquadome alone. The countless volunteers that help at our events are immeasurably important. They keep they place operational and the board members from having panic attacks. Admission from shows, fundraising, donations, and (if necessary) scrounging from the board member’s pockets. We need around $700 each month for rent and utilities, and there are licenses we have to pay for on occasion. Anytime you come to one of our events, donate, or tell your friends about us, you truly are helping us keep our doors open! During The Aquadome’s first generation, the venue was home to shows, a haunted house, a carnival, bookbinding workshops, karate lessons, breakdancing parties, weekly vegan dinners, vegan potlucks on Sundays, figure drawing classes, screen-printing lessons, political organizing, film screenings, and art shows (including the Tom Thumb, a traveling art show). The building was also used as practice space for bands, studio space for artists, a rental space for various groups, and a meetings place for clubs and organizations such as Anti-Racist Action and the Lonely Minds Club. In the spring of 2014, the physical location of The Aquadome collapsed due to what news reports refereed to as a “land hurricane.” Since then, The Aquadome has kept on trucking, throwing shows, poetry slams, and open mics at local shops and unrented buildings. Oct 18, 2012 – “Aquadome Sound System” (News36) – A video about our quest to buy a PA system! Feb 23, 2012 – “All eyes on: Brie Vuagniaux” (The Index) – An article about the Aquadome’s former president, Brie Vuagniaux, who reopened the space. Aug 31, 2011 – “Unexpected harmonies” (The Index) – An article about the Friday, Aug. 26, 2011 show at The Aquadome. Sep 8, 2011 – “Aquadome Venue Reopens in Kirksville” (News36) – A video about the re-opening of The Aquadome. 2001 – “Community of Music” (Echo, Vol. 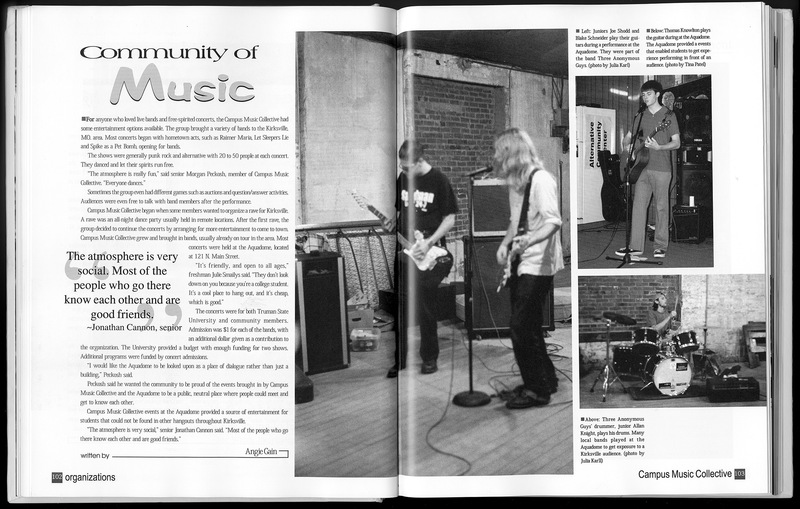 100) – An early article about the Campus Music Collective, a TSU student organization with close ties to The Aquadome. Tom Thumb Annual Floating Art Exhibition (known as Tom Thumb for short) is an annual, non-juried art festival in Kirksville, MO organized by the community and funded entirely through donations. An amazing resource for people interested in DIY venues and culture. Operated and payed for by one dude. Donate if you can!